The following information has been compiled from various articles and my personal knowledge of many of the personalities involved. When I began here in 1981, my lab was adjacent to Prof. Sir Charles Oatley during his retirement years at the Engineering Labs. All but one of Oatley's students are still very active to-day. Sadly, Ken Sander ( Oatley's first student on the electron microscope) died some years ago. The early history of the Scanning Electron Microscope (SEM) is filled with many amusing stories. It was one of my great ambitions to write the complete book one day .....and this has happened. The book was published by Academic Press Vol 133. This is a contribution by all of his research students and many others. However, one story that the Prof. used to tell, is that when the SEM was being considered as a commercial product, a group of Marketing experts were sent out to make an evaluation of the number of SEMs that could be sold. Hang on to your hat...they came back with... probably between 6 (six), and 10 (ten) would saturate the market! Of course, they got it all wrong, the reason being that they asked existing Electron Microscope users if they could use a microscope that could, at that time, only do about 200 Angstroms resolution (1 nm=10 Angstrom units). (The transmission electron microscope (TEM) was at that time producing sub-50 Angstrom.) Today there are in excess of 50,000 SEMs world-wide. So much for marketing! The first SEM used to examine the surface of a solid specimen was described by Zworykin et al. (1942), working in the RCA Laboratories in the United States. The electron optics of the instrument consisted of three electrostatic lenses with scan coils placed between the second and third lenses The electron gun was located at the bottom so the specimen chamber was at a comfortable height for the operator. This was a common practice in the early days. It did suffer from the slight problem however, that the specimen might fall down the column. A resolution of about 50 nm was achieved with this first SEM. By comparison with the rapidly developing TEM, this figure was considered unexciting and further development lapsed. In the late 1940s C. W. Oatley, then a lecturer in the Engineering Department of Cambridge University, England, became interested in conducting research in the field of electron optics and decided to re-investigate the SEM as a complement to the work being done on the TEM by V. E. Cosslett, also in Cambridge at the Physics Department. One of Oatley's students, Ken Sander, began work on a column for a transmission electron microscope using electrostatic lenses, but Ken took ill after about one year and had to leave for a time. This work then was taken up by Dennis McMullan in 1948, and he and Oatley built their first SEM. By 1952 this instrument had achieved a resolution of 50 nm, but by far the most important thing about this SEM is that it produced the first micrographs showing the striking three-dimensional imaging characteristics of the modern-day SEM (McMullan (1953)). 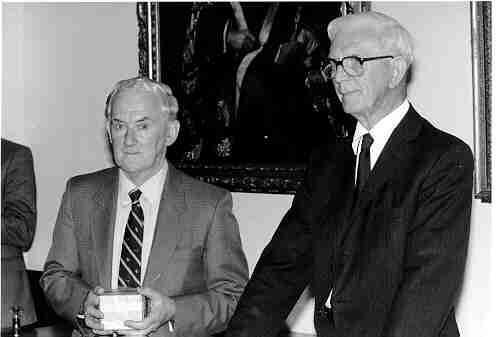 Dennis McMullan was followed by Ken Smith (started 1952) who took over SEM1, made a number of improvements to the electron optical system, and improved the efficiency of secondary electron collection. He showed for the first time that a stable image could be formed using the true low-energy component of the total secondary emission. Ken has told me personally that during this period in the development of the SEM, microscopists in general showed virtually no interest in the instrument, and he and Oatley were continually looking for applications to promote the SEM; many which they tried were never published. However, they published the first paper setting out clearly the fields of application for the SEM (Smith and Oatley (1955)). The third research student on the SEM under Oatley's supervision was O. C. Wells (started 1953), who built a second SEM, also incorporating electrostatic lenses; unlike SEM1, however, this instrument had the gun at the bottom of the column - a configuration considered better for experimental work. All SEMs built in the Engineering Department subsequently conformed to this layout. Wells pioneered the use of the scintillator backscattered (BSE) detector (as an alternative to the secondary electron multiplier used in SEM1) and applied his SEM to many new types of specimen including a large-scale study of fibres. He was also the first to use stereographic pairs to produce SEM micrographs with quantifiable depth information (Wells (1960)). The next important step was taken by Oatley's fourth research student, Everhart (started 1955), who improved the secondary electron (SE) detector by using a scintillator to convert electrons to photons, which were then transmitted by a light pipe directly interfaced to the photomultiplier tube. This idea was followed up by Thornley (started 1957), and their ground-breaking work resulted in the publication of a much-quoted paper: "Wide-band detector for micro-microampere low-energy electron currents" (Everhart and Thornley (1960)). Replacement of the electron multiplier with the new scintillator/photomultiplier combination increased the amount of signal collected and resulted in an improvement in signal-to-noise ratio. Hence, weak contrast mechanisms, such as voltage contrast (discovered by Oatley and Everhart (1957)) could be better investigated. The term " voltage contrast" evolved from the fact that as the voltage applied to a specimen was changed, the image contrast changed. (Tom Everhart and Oatley were investigating this one day and Tom said: " Well, voltage contrast!" and the term has stuck to this day). Image interpretation was also improved in this early period of research when both Everhart and Wells made the first quantitative studies of the effects of beam penetration on image formation in the SEM. It was always one of Oatley's great ambitions to produce and market a really simple low-cost SEM; he argued that most of the work undertaken by microscopists did not require high resolution. To further this idea Peter Spreadbury, his fifth student (started 1956), built a simple SEM utilising a CRT as a display unit. New fields of application were opened up by Gary Stewart (started 1958) who fitted an ion gun to the SEM specimen chamber to allow ion bombardment of the specimen. After his research, Gary went on to the Cambridge Instrument Company to pioneer the production of the Stereoscan. The ion beam work was later extended by Alec Broers (started 1961) who improved the ion beam optics of the instrument and added a magnetic objective lens to improve resolution. He used this set-up to conduct some of the earliest experiments in electron beam microfabrication. Another breakthrough was achieved by Haroon Ahmed (started 1959) who modified the SEM built by Wells (SEM2) to enable the examination of thermionic emitters at temperatures exceeding 1000K. The first SEM in the Department to achieve a resolution of 10 nm was built by Fabian Pease (started 1960). This was an all magnetic lens SEM, the fifth to be constructed in the Group. Several of these SEMs were later manufactured in the Departmental Workshops and used by other Groups within the University. No description of the work in Oatley's Group would be complete without mention of Les Peters, chief technician, who had a hand in the construction of all the instruments described and helped all the research students with their experimental work. For his services to the Department Les was awarded an honorary MA degree by the University in 1990. Pictured here are Les Peters and Charles Oatley together in the Board Room of the Engineering Department on the occasion of a celebration held to mark the event. The contribution of Joan Duffield, Charles Oatley's secretary, to the success of this early work must also be recognised. She organised all the paperwork for the Group, typed the technical papers and typed the majority of the research students' dissertations - in the days when five all-correct carbon copies were the norm and word processors were unheard of! Her work in those early days was invaluable. With his appointment in 1960 to the Chair of Electrical Engineering in the Department, Charles Oatley's direct involvement in the supervision of research students came to an end; this task was taken over by Bill Nixon who joined the Group in 1959 having worked in the Cavendish EM Group with V. E. Cosslett for a number of years. So ended the first phase of the research on the scanning electron microscope at the University Engineering Department. I would like to thank KCA Smith for the his encouragement, contributions and support in generating this information. A paper present by Ken at EMAG 97 is reprinted here with kind permission of the IOP. Much of this information and a great deal more was published in our book. Everhart TE, Thornley RFM (1960): Wide-band detector for micro-microampere low-energy electron currents. J. Sci. Instrum. 37, 246-248 . Oatley CW and Everhart TE (1957): The examination of p-n junctions in the scanning electron microscope. J. Electronics 2, 568-570. Smith KCA and Oatley CW (1955): The scanning electron microscope and its fields of application. Br. J. Appl. Phys. 6, 391-399.
von Ardenne M (1938a): Das Elektronen-Rastermikroskop. Theoretische Grundlagen. Z. Phys. 109, 553-572. Wells OC (1960): Correction of errors in electron stereomicroscopy. Br. J. Appl. Phys. 11, 119-201. Zworykin VA, Hillier J and Snyder RL (1942): A scanning electron microscope. ASTM Bull. 117, 15-23.